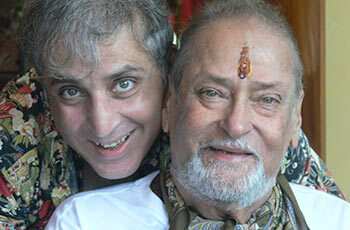 Aditya Raj Kapoor, Shammi Kapoor and Geeta Bali's son, talks to Patcy N/Rediff.com about his mother. Geeta Bali, one of the most interesting actresses of her time, died of smallpox, aged just 34, in January 1965. 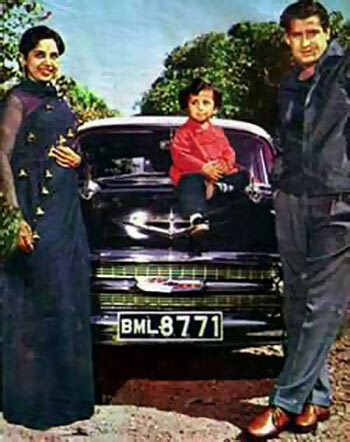 On her 50th death anniversary, her son Aditya Raj Kapoor (in the photograph as a boy with his mother) shares fond memories, including the last month of her life on the sets of her film, Ek Chaddar Maili Si. I was nine years old when my mother passed away. Yet, I remember her quite well. She was very loving, full of life and very adventurous. She would take me on long drives. I have learnt more about my mother in the last one year as I am writing a book on her. I have been researching on her and her ancestors, going as far back as 1850. Her father Pandit Kartar Singh Bali used to sing kirtans at Golden Temple. He was a highly educated man, a Vedic scholar and a Granth Sahib scholar. My mother was a Sardar. She was born in Amritsar, Punjab. Her real name was Harkirtan Kaur. She had a contract to sing for All India Radio. She was a trained classical dancer, and took part in stage plays as well. She had learnt horse riding and a martial art called Gatka. 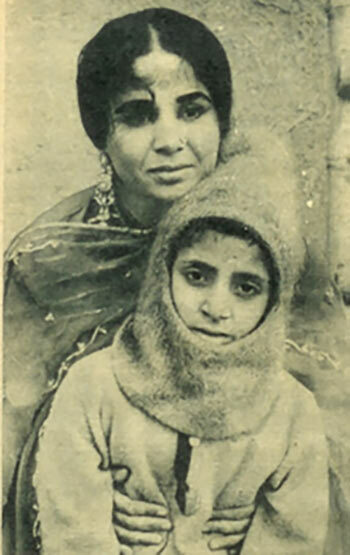 She was a child star from Punjab. At the age of 12, she starred in a film, The Cobbler. Later, she did a film, Badnaami. She came to Mumbai when she was 16 or 17. She changed her name to Geeta, which was the name of her character in a film. Bali was her maiden surname. She had a contract with a producer in Amritsar and he transferred the contract to Kidar Sharma, who cast her with Bharat Bhushan, the famous star of his time, in Sohag Raat (1948), and then Neki Badi (1949). She made a popular pair with Dev Anand. They did many films together -- Baazi (1951), Jaal (1952), Ferry (1954), Milap (1955), Faraar (1955), and Pocket Maar (1956)). Soon after that, she got married (to Shammi Kapoor, in 1955). My mother didn't tell me how they got married, but my father told me about it later. He told me they were shooting in Ranikhet for Rangeen Ratein when they fell in love. After they came to Mumbai, my father proposed, but my mother did not give her consent immediately. They married the day she said yes. They went to the temple, but the temple was closed, so the priest asked them to come the next morning. They went at 4 am and got married. Very dramatic and filmi! Instead of putting sindoor, he put red lipstick in her maang! My mother was a career girl from a young age. She was the only Kapoor woman at the time to continue to work in films after her wedding. She contributed a lot to the making of Shammi Kapoor. She gave him his confidence and his personality. If you see the way Shammiji danced... that was Geeta Bali's personality. In her films like Albela, her grace, vivaciousness and naughtiness came out. She was not the stereotype suffering heroine. My mother was a bigger and more successful star than my father when they got married. I was born in 1956. Shammiji's Junglee (1961) released when I was five or six years old and it made my father famous. I knew my parents were very popular actors. When they came to meet me at the Lawrence School, Sanawar (in Himachal Pradesh), all the teachers would want to meet them. My mother was very hands on. She was strict when she had to teach us tradition and customs. She was very pushy; she wanted me to learn singing and fine arts because she did not have that kind of background. She was always telling her friends how she wanted me to be a gentleman. Because of her blessings I am not in the film industry. I am doing something qualitative. Just two months ago, I finished 13,000 km in 73 days on a bike. I have taken my wife on a 5,500 km bike ride. This adventurous quality I have inherited from my mother. In three months, my book Bike on a Hike will be published. I am a cook and do charcoal painting too. I am sure my mother would be proud of me. I was with my mother in the last month of her life, when she was shooting in Punjab for Ek Chaddar Maili Si, directed by Rajinder Bedi (the project was shelved). Dharmendra and his son Sunny Deol were also there. 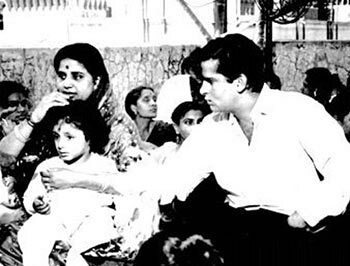 My mother played Dharmendra's elder sister in the film. My father came to take us away after she fell ill on location. She got smallpox. She returned to Mumbai with high fever. My sister and I stayed with my uncle Raj Kapoor as my mother was bedridden. She passed away in just 15 days. It was very tragic. My father was devastated by her death. He had relied too much on her. He couldn't come to terms with that for a very long time. It was very tough for me to cope for the first couple of years. Being in boarding school made it worse. My favourite film of my mother's is Albela because that is how she was in real life too, a very gracious lady, ready to help all, full of music, fun and laughter. If my mother liked someone, she would give her heart and soul to that person.